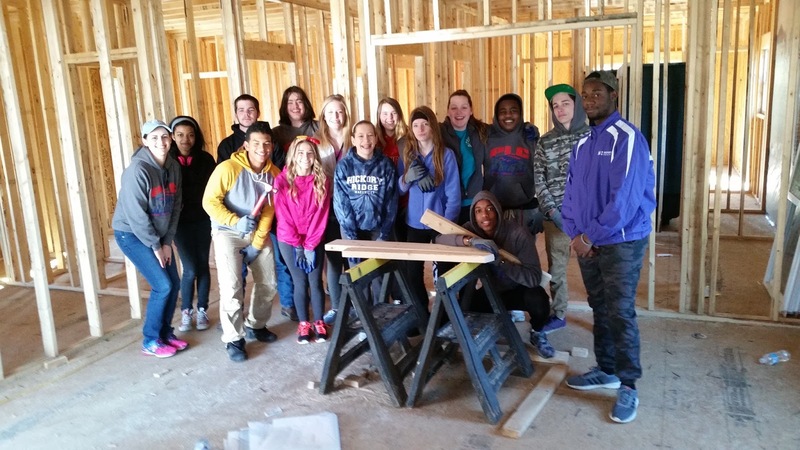 On March 4th, a group of high school students from Cabarrus County Schools’ Performance Learning Center came out and worked on a build site with Habitat Cabarrus as part of an out of class learning experience. The students showed their support for Habitat and the future homeowner by helping us put up siding and performing a variety of other tasks needed in order to build the home. Performance Learning Center also invited our Volunteer Coordinator, Dyana Bostian, to their school to speak with high schoolers about Habitat for Humanity, homeownership and the finances that come along with owning a home. The students were very engaged and excited about partnering with Habitat Cabarrus through our various volunteer programs! We would like to thank all of the students who volunteered with us recently as well as Performance Learning Center and Communities in Schools of Cabarrus County for making this possible. You can help build a Habitat home too! No previous experience is needed, just come prepared to learn. Volunteers with Habitat should be at least 18 years old. Minors who are 16 or 17 years old must be accompanied by an adult and are limited to certain volunteer activities. To learn more about volunteering with Habitat Cabarrus, contact Dyana Bostian or visit www.habitatcabarrus.org. 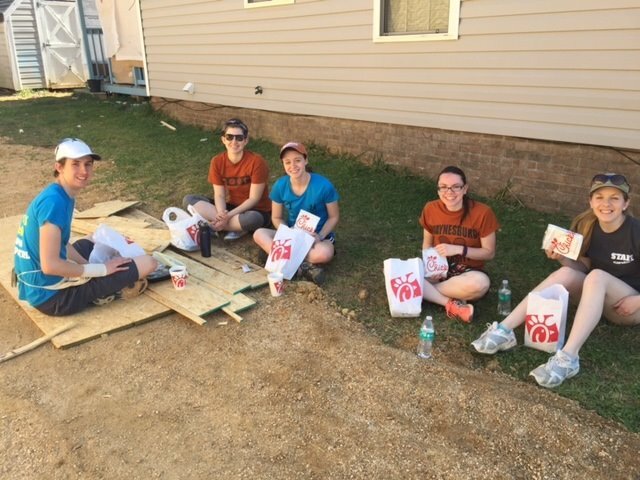 Waynesburg University’s mission is to educate students to “make connections between faith, learning and serving so they might faithfully transform their communities and the world.” In only one week, a group of Waynesburg University students from Waynesburg, Pennsylvania were able to take a foundation of a home and put together its outer layers. They could have been enjoying spring break at the beach, but they preferred giving back to someone they don’t even know, Ms. Candis Grier. We are so grateful for their week of extraordinary service in our community. We would also like to give a special thank you to the Cabarrus County community for being such wonderful hosts for our visitors from afar. St. James Lutheran Church hosted our Waynesburg University volunteers this week while the Cannon Memorial YMCA let them use their showers every night. Lunch was provided by Target, Chick-fil-A Concord Parkway, Burger King, Domino’s Pizza, and Wendy’s. McGill Baptist Church and First Presbyterian Church provided dinner. We cannot thank our community partners enough for helping us take care of our guests this week and to those who will be hosting and feeding our next three Collegiate Challenge groups. If you are interested in providing meals or snacks to our Collegiate Challenge teams, please contact Dyana Bostian. 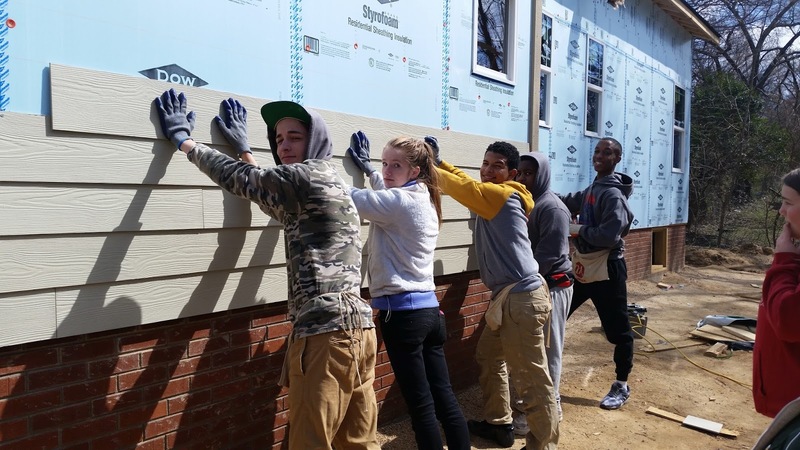 Be sure to check back each week to see students from Stockton University, Northwestern University, and Gates County High School continue the 2016 Collegiate Challenge build!